Hello Danger. I know I speak for Bill too when I say we'll be glad to answer any questions you might have as best we can. You'll probably get the short answers though....we gotta save some things for the book! Thanks for posting BillThames. I too was a few years younger, I'll bet a couple years younger than you and some of these other folks, so I feel like I "missed it by that much", as Maxwell Smart would say. So to hear from folks like you who were there makes me feel less like I missed something. We are all especially grateful because, despite some well meaning attempts, this information is mostly not written down. And we need to hear the stories from them what was thar, otherwise it gets lost or misremembered second hand. And BTW, I spell my name Danger. Well, Mr Danger, is that a pickle in that brown paper bag, or a two-bit ring from a cracker-back Jox? Acutually, I was only a few years younger than Gregg and Duane were...I'll be 57 next month. I was a senior in high School when the Hour Glass recorded and released Power of Love. My band followed the Allman Joys, and the Nightcrawlers as the house band at the Martinique, playing over 200 nights in late 1967 and 1968 up to August. Amazingly we all graduated from HS and went to college, though I slep through much of my freshman year. Anything you want to know, just ask. And, no, I wasn't in on the foot shooting, but I watched Gregg playing organ sitting down for a few weeks with his bandaged foot hanging over the dancefloor at the "Q." Some men have a god, that keeps them from harm. Some men have a bottle, at the end of their arm. "None of us had seen an electric Sitar before, so Duane took lots of time at the sound check to show us what it did, and what the sympathetic strings were all about." I don't have the slightest idea who made Duane's Sitar because I only saw the it a couple of times, and I'm a drummer, and don't usually interest myself in those mundane stringed instruments. From what I remember, it looked just like a regular six-stringed guitar except that on one side of the strings there were another grouping of much shorter strings that made the "harp" sound for, lack of a better words. Duane told us that they were sympathetic strings. That's all I remember, but for almost forty years ago, that's a lot. 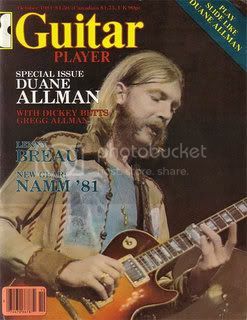 It did look quite similar to some of those photo's posted on the other thread about Duane's Electric Sitar. The description below sounds familiar. On headstock: "Star's Electric Guitar: Vintage Sound"
It did look quite similar to some of those photo's posted on the other thread about Duane's Electric Sitar. i hope this helps clear up your questions. A friend of mine posed a thought to me a while ago about the Hour Glass that I had never considered. Was there a period of time during which Gregg had already left the band to head back to California but the rest of the band remained together as a performing entity? Did this occurr if even for a short time, and if so, who was singing for the band? Johnny said when the Coral sitars came out someone gave one to Liberty who in turn gave it to Duane. That's how he got the first sitar he played.